With an acute sense of rhythm and an ear for the odd, the Berlin-based composer, musician, producer and DJ Andrea Benini has put together a unique mix for FvF that is neither here nor there. Through extensive digging and an insatiable appetite for sound, Andrea gives us a look into the syncopation of his thoughts and refined sense of musical taste. Working under the stage name Mop Mop since 2005, his music strikes somewhere between jazz, funk and dance music, with clear influences from African rhythms to techno. From the small village of Cesena, Italy and now based in Berlin, the mixture feels effortless and natural. Mop Mop’s unique take on jazz has made it onto the soundtrack of Woody Allen’s To Rome with Love and he’s been constantly touring the world both as band leader and DJ. Using his background as a percussionist he lets his ear and intuition guide his mix, taking us to some far-off places along the way. How did you select the tracks for the mix? I’m a collector so I have a lot of music here at home. I really like to put together many different kinds of music even though sometimes it sounds a bit weird. Nowadays we’re okay with listening to anything. Even the kids—they’re used to listening to all sorts of music. I like to move from organic sounds to electronic sounds as well. For the mixtape I used some records I have here on vinyl, some digital files: all music I listen to. I’m a drummer and percussionist so the rhythm is really important to me and I also incorporated a lot of Afro-American music and Eastern percussive music. It also depends on the mood I’m in when I make a mix. What mood were you in while you made this mixtape? It was a mixed mood because it wasn’t a really sunny day in Berlin [laughs], it was quite rainy and a bit cold so I wanted to be somewhere else. I took some inspiration from that. I was here in my studio but I was dreaming about being on an island somewhere. The mix gets to some very obscure places, how would you describe it? You’ve been doing this project Mop Mop since 2005—what is the significance of the name? 2005 is when we released the first album but we have been working on the project since the late ’90s, when I was studying in Bologna. One day I went to the library as it was closing and I found this small jazz dictionary from the ’50s. When I was reading it at home I found all these names and I saw this term ‘Mop Mop.’ The term comes from New Orleans in the 1920s—during funerals there were these brass bands playing, just horns and bass, and they’d all play solos. Basically we were doing the same thing! A bunch of kids playing one or two chord psychedelic music and soloing over it. So finally we decided to take the name. Then, some years later, I discovered that it was also the name of one of my favorite drummers, Max Roach. What are some other influences for you? A lot of Italian soundtracks from the ’50s and ’60s, like Armando Trovajoli, Nino Rota, Ennio Morricone. In the ’50s and ’60s, the film soundtracks were massive! Also the films were amazing, the connection between film and music was great. I’m still listening to these soundtracks also because the quality of recording is amazing as well as the compositions and arrangements. Also the club music of today and since I live in Berlin—techno. I dig all of this kind of music. You just debuted your fifth studio album, Lunar Love. What made you come out of musical hibernation. It always takes a lot of time to make an album. We produce in a modern way but we are also using analog equipment, a lot of instruments so it also gets expensive mixing digital and analog. It’s also important for me to create an album that can comment on contemporary music but can also be listened to in ten or twenty years. It’s not just about creating a clubby track that’s good for the moment that you can play and dance to—because after three months it’ll be gone. For me it’s important to create something that people can enjoy for years. This takes time. Mop Mop and Co. in action, making Lunar Love. 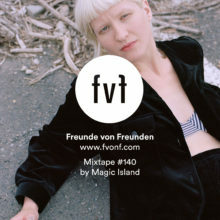 Thank you, Andrea for letting us step into your mind with your powerful and eclectic mixtape. For more Mop Mop, check out his Facebook and be sure to listen to his latest album, Lunar Love.